Born in Barcelona in 1955, Enric Miralles established himself as part of the rising Spanish architecture scene of the late 1980s together with his first wife, architect Carme Pinós. From the mid-1990s he formed a new practice with his second wife, Benedetta Tagliabue, with whom he worked until his early death in 2000. 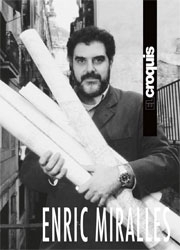 This extensive tribute to Miralles and his all too short career covers the trajectory of his collaborations, solo works, writings, and more, following from projects such as the La Llauna School and La Mina Civic Centre, to an increasingly global portfolio including the Japan National Library, Hamburg Music School, Venice School of Architecture, and the Scottish Parliament.